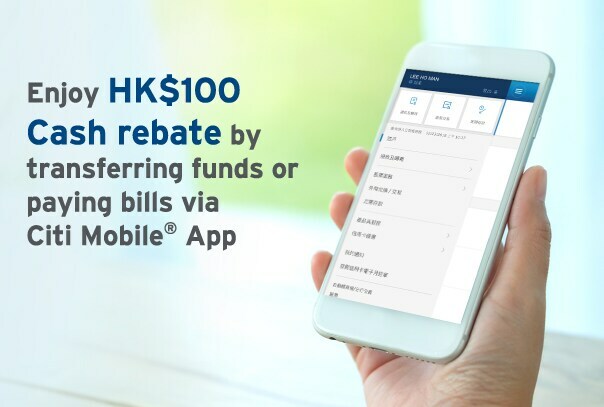 As a selected client, from June 1, 2018 to July 31, 2018, enjoy a cash rebate of HK$100 by successfully completing a fund transfer or bill payment transaction of HK$100 or above via Citi Mobile App (e.g. a transfer between self-named or third party Citibank accounts, to settle statement balance of your Citi Credit Card account, or a transfer to other local or overseas accounts, etc). If you need to add a new payee for fund transfer, click here to learn how. Do not have your User ID yet or forgotten your password? retrieve your User ID and password directly via Citi Mobile App now! to enjoy this reward as well as a streamlined mobile banking experience. via Citi Mobile App now! 1. The Promotion Period is from June 1, 2018 to July 31, 2018 (the “Promotion Period”). b. completed a transfer transaction of HK$100 or above via the Citibank Online Banking, Citibank Mobile Banking through Citi Mobile ® App or browsers on mobile devices (“Citibank digital banking”) within the Promotion Period with the transaction amount successfully posted in the designated account (“the Eligible Transaction”). 3. Eligible Customers who fulfill the requirements as stipulated above will be entitled to receive a cash rebate of HK$100 (the “rebate”). 4. Each Eligible Customer can only enjoy the rebate once irrespective of the number of transactions completed during the Promotion Period. 5. Eligible Customers who terminate their accounts through which the Eligible Transaction was conducted at the time of offer fulfillment will be disqualified for the Offer. 6. The rebate will be automatically credited to the Eligible Customer’s account by September 30, 2018. In order to receive the rebate, the Eligible Customer’s account (Savings account, checking account, HKD step-up account) must be valid, not in default and in good standing (as determined by the Bank at its sole discretion) at the time the Bank credits the prize, otherwise Citibank reserves the right to forfeit the prize without prior notice. 7. If the Eligible Customer holds more than one Citibank account (savings account, checking account or HKD step-up account), the Bank will determine and credit the rebate to the account according to the below sequence: (1) HKD Step-up Account, (2) HKD Savings account and (3) HKD Checking account. 8. The Offer is not applicable to (i) Clients who are employees of the Bank or Citibank N.A. or its subsidiaries or (ii) US persons. 9. Citibank reserves the right to amend the terms & conditions without prior notice, while all matters and disputes are subject to the final decision of Citibank. 10. In the event of any discrepancy between the English and Chinese versions of these terms and conditions, the English version shall prevail.